Relic and Treasure Hunters across the Globe have come together with Temerity to bring you this February issue. 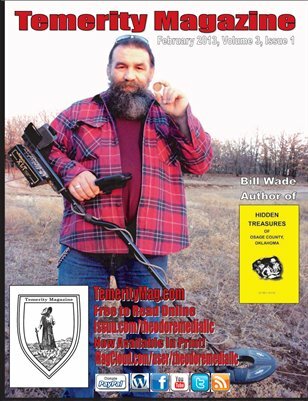 Metal Detectorists, Picker's, Resellers, Collectors, Genealogists, Historians, Treasure Tales, Privy Diggers you name it, you will find your favorite relic and treasure addiction within our pages. Next issue is May 1st with a submission deadline of April 20th. Please join us in Temerity by submitting your article to editor@temeritymagazine.com Get Grizzly!